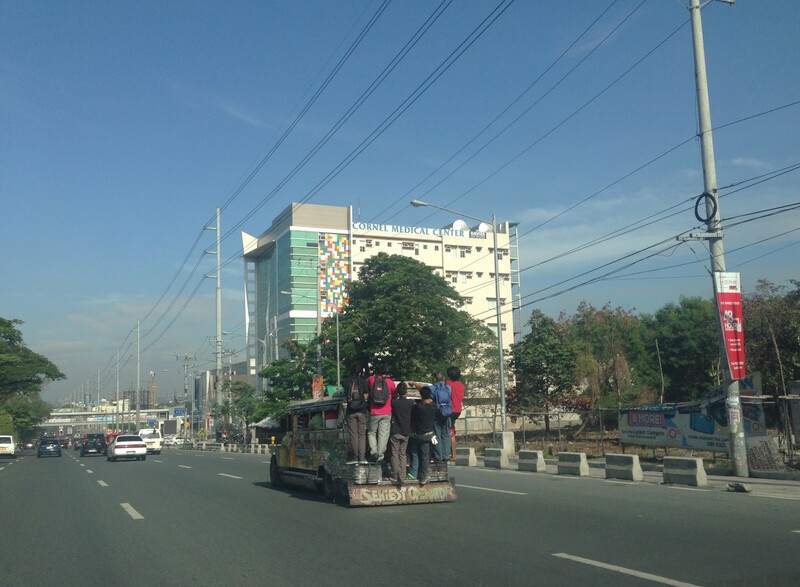 Traveling to the office one morning, I spotted a jeepney overloaded with passengers. Many were already hanging on to the jeepney at the rear and I could count eight people including 6 who were practically dangling from the jeepney. Such behaviour is common among males who do this just so they could get a ride to their workplaces. But this is also common among students who, with their bags (usually backpacks) face even greater risks when they hang on at the rear of jeepneys. This is actually illegal but poor traffic enforcement combined with the inadequacies of public transport force a lot of people to make sabit (hang-on) to the jeepney. Granted that some of these people have no intention of paying their fares but there is a real danger of lost lives if not serious injuries if one falls off the vehicles. Eight passengers hanging on to a jeepney as it is stopped at an intersection. Note the ones with backpacks that add to the degree of difficulty for this practice just to get a ride to work or school. The same jeepney with all 8 passengers dangling as the vehicle speeds up along Marcos Highway in Antipolo. These sabit passengers are actually lucky that their driver is not so reckless (e.g., changing lanes so often, making abrupt movements). This practice is among a host of seemingly small but important items that can easily be addressed with strict enforcement of traffic rules and regulations. Prompt and timely apprehension and penalties will go a long way into influencing behaviour change among both drivers and passengers. I think the basic idea going on in the minds of both parties is that despite the practice, there’s seldom an incident when a passenger falls off from the jeepney. Such should not be the case and an acceptable reason if we are to prevent untoward incidents from happening, and it starts with sending a strong message through proper enforcement. Are the authorities up to the challenge though? Or is the ningas cogon attitude going to prevail all the time for such situations? By d0ctrine in Behavior, Jeepney, Road Safety on May 27, 2014 .